The Light House is a truly unique place to stay - our bright young team will welcome you to our beautiful Georgian townhouse bursting with character and charm. We have created a fusion of contemporary living space with good old fashioned family hospitality. 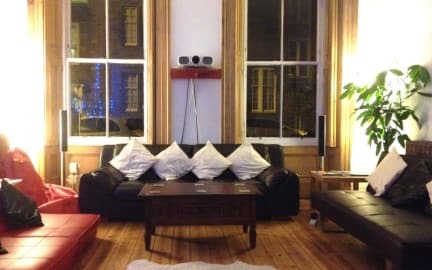 Our guests often say it's more like a family home than a hostel, with a laid back attitude and cosy friendly atmosphere. The Light House is the place to chill out and make new friends. We are only 15 minutes' walk to Edinburgh Castle. As a international faith community, we enjoy sharing our home with guests through caring homely hospitality. We follow Jesus' teachings of compassion by offering friendship and a safe resting place for travellers. We donate a substantial portion of our profits to a housing charity. So when you stay with us, you are also helping to provide homes for people in need. Free Wi-Fi, free internet access on a desk top computer. Free lockers, free towel hire, free linen. Free breakfast. Free tea and coffee all day. Free power adaptor hire, free reading light hire. Free ear plugs, free shower gel. Reception is open from 7am to 10pm and check in time is from 3pm to 10pm. If you arrive in the city before 3pm, please feel free to drop off your luggage and we will give you a map and introduction to Edinburgh, then come back after 3pm to check in. We aim to provide a good night's sleep for our guests so that everyone feels refreshed the next day to explore the city or to continue with their onward journey. Therefore there is strictly no check in after 10pm. If you plan to arrive after 10pm, then please do not book with us. This rule can be extended to 11pm in case of delays in transportation. After 11pm there will be no entry until the following day. We are situated in the artistic area of the city centre. Nearby are 4 cinemas, 3 theatres, a concert hall, a wide selection of restaurants, bars, coffee houses - and a co-operative super market that opens till 10pm for your essential supplies! 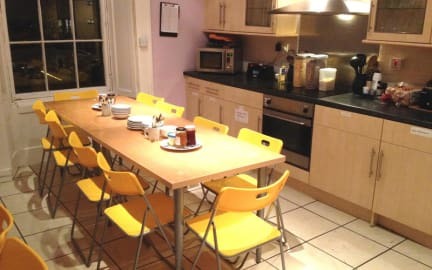 The communal living areas are clean and cosy providing a great space to relax and unwind after a busy day of sightseeing. We have a spacious comfy lounge where you can relax and enjoy a wide selection of movies on our home cinema system with HD projector and surround sound. We have a fully equipped self catering kitchen including a dish washer...... so no need to wash up, Yay! There is also a large back garden where we host regular campfires and BBQs - so bring your guitars and best (or worst) singing voices and join us for a good old sing along around the fire; dancing is optional! We offer a variety of bright and spacious rooms ranging from a 2-bed private room to a 10-bed dorm. The 2-bed private room has a double bed and a single bed - so it can accommodate up to a family of 3. We operate a no shoes policy in The Light House to keep the house in spotless order, a shoe rack and slippers are provided at the entrance making it feel like a real home from home. There is a no smoking policy throughout the hostel with smoking area in the front garden. There is no curfew. However, we are not a party hostel, therefore the lounge and kitchen are locked at midnight and we request that guests be very quiet when returning after midnight, this is to ensure other guests who are sleeping are not disturbed. Please be aware there are different booking conditions for bank holiday weekends, sports event weekends, August, Christmas and New Year due to high demands during these periods; ask for details. Check-in is after 15:00 only - and till 22:00. Reception is open from 7:00 to 22:00. If less than 24 hours cancellation notice is given, price of first three nights will be charged. If between 24 to 48 hours cancellation notice is given, price of first two nights will be charged. If between 48 to 72 hours cancellation notice is given, price of first night will be charged. No show will result the charge of the full booking. Note: Our cancellation policy supersedes Hostelworld's standard cancellation policy. Guests under the age of 15 must stay in a private room with a family member who is over 18. Guests aged 16 and 17 travelling alone must have a letter signed by a parent or a guardian giving explicit authorisation to travel alone, also they must provide a photocopy of their parent's/guardian's ID.